On the Pega 7 Platform, instances of the Strategy rule define a personalized decision that is delivered to an application. When building a headless decisioning scenario, you reference strategies from instances of the Data Flow rule. This tutorial explains how to use the Next-best-action and response strategies, describes their configuration details, and provides links to additional resources. You use the Next-best-action strategy to allow your application to take the best decision for every customer. The response strategy is necessary to catch the customers' responses and improve the adaptive model that is used in the Next-best-action strategy. The procedure described here is a part of building a model headless decisioning scenario. Before you continue, read the introduction about the headless decisioning scenario Headless decisioning on the Pega 7 Platform. This tutorial takes 30 minutes to complete if you decide to reuse the NextBestAction strategy in the DMOrg-DMSample-Data-Customer class that is available in the DMSample app. This scenario uses the NextBestAction strategy in the DMOrg-DMSample-Data-Customer class that is available in the DMSample app. This Strategy rule instance selects banners to display to customers who log in to an organization's website. You can build your own strategy by using the NextBestAction strategy as a reference. Next-best-action strategies allow applications to make the best decision about a particular business issue (such as retention, recruitment, risk, recommendation, and so on). The standard approach to find the next best action (offer a proposition) for each customer consists of several steps. First, the strategy checks propositions' eligibility for all customers and segments customers according to this information. The strategy needs to to identify which proposition or propositions can be offered to a particular customer in order to segment customers. Next, the strategy uses predictive models to check the propensity for each proposition by calculating the probability that a customer will accept the proposition. Finally, the strategy selects the action for each customer segment and the best decision path. To learn more about constructing blocks of strategies, read about strategy components in Strategy rule form - Completing the Strategy tab. Create an instance of the Strategy rule that identifies website user actions (which banner a user clicked and which banner a user did not click) and use them to generate outcomes that update customers' interaction history and refine adaptive models. This strategy converts user actions into outcomes that are tracked in Interaction History and by Adaptive Models. From Application Explorer, right-click the DMOrg-DMSample-Int-Response class and select Create > Decision > Strategy. In the Label field, enter Response Strategy. Define Strategy results on a custom Strategy Results class. Ensure that the Apply to field contains the class in which you want to save the strategy (DMOrg-DMSample-Int-Response). Right-click the canvas and select Enable external input. Right-click the canvas and click Enrichment > Data Join. Connect the External Input component with the Data Join component. Open the Data Join component. In the Name field, enter Clicked. In the Join tab, from the Type list, select Pages. In the Name field, select .CustomerResponse. In the Clicked column, select .pyIssue. In the .CustomerResponse column, select .Issue. In the Clicked column, select .pyGroup. In the .CustomerResponse column, select .Group. In the Clicked column, select .pyName. In the .CustomerResponse column, select .Name. Select the Exclude source component results that do not match join condition option. Right-click the canvas and select Enrichment > Set Property. Connect the component Data Join with the Set Property component. Open the Set Property component. In the Name field, enter Click. In the Target tab, click Add Item. From the Action list, select Set. In the Target column, enter .pyOutcome. In the Source column, enter "Click". Connect the Set Property component with the Results component. Right-click on the canvas and select Selection > Exclusion. Connect the External Input component with the Exclusion component. In the Name field, enter Not Clicked. In the Exclude from source components section, in the Type field, select Pages. In the Not Clicked column, select .pyIssue. In the .CustomerResponse column, select .Issue. In the Not Clicked column, select .pyGroup. In the .CustomerResponse column, select .Group. In the Not Clicked column, select .pyName. In the .CustomerResponse column, select .Name. Connect the Exclusion component with the Set Property component. In the Name field, enter Impress. In the Source column, enter "Impress". Connect Set Property with Results component. When you want to create a response strategy, you need to enable the External Input in your strategy. When executed from a data flow, with the appropriate configuration, this strategy starts with the result of the original decision. The previous results are made available through the External Inputs component. 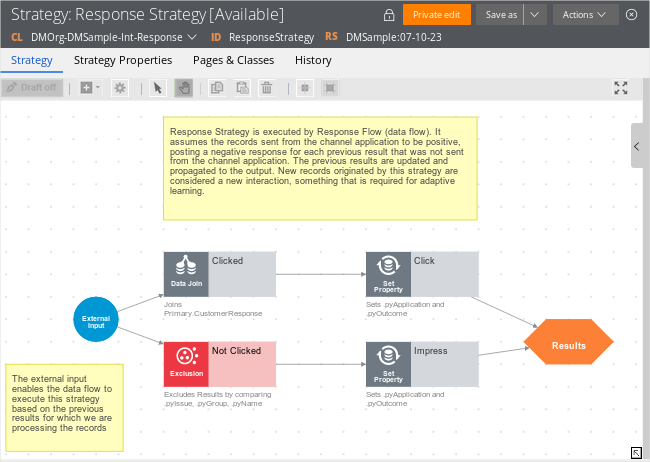 After you create the ResponseStrategy strategy, you can reference it from the ResponseFlow data flow. When the headless decisioning scenario is operational, the ResponseStrategy strategy gets the list of the items that the user clicked. The strategy separates the clicked banners from the ones that were not clicked. The original decision results go into the Clicked Data Join and Not Clicked Exclusion component. The Clicked Data Join outputs the original decision results that were clicked. In the Data Join component, decision results are joined with the .CustomerResponse clipboard property when the conditions that are set in the Data Join component are met. Only one decision result meets the condition; it comes out of the Data Join component, and in the Click Set Property component its outcome is set to Click. The Not Clicked Data Join component outputs the original decision results that were not clicked. In the Exclusion component, decision results are joined with the .CustomerResponse clipboard property when the conditions that are set in the Exclusion component are met. Two decision results meet the condition; they come out of the Exclusion component and in the Click Set Property component their outcome is set to Impress. The three original decision results that entered the ResponseStrategy strategy through the External Input component go into the Results component. The strategy does not create any new records; it sets the outcome of two records to Impress and Accept. 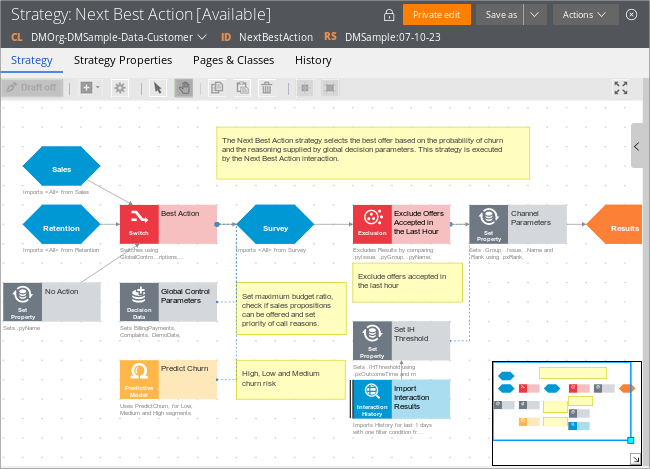 The decision results from the ResponseStrategy strategy return to the ResponseFlow data flow and are written into the Interaction History data set and the Adaptive Analytics data set. The results stored in these data sets improve the adaptive model outputs and can be accounted for by the subsequent decisions. Now that you have prepared instances of the Strategy rule that are necessary in the headless decisioning scenario, you can reference them from instances of the Data Flow rule. For more information about data flows in the headless decisioning scenario, see the following PDN article: Tutorial: Building a headless decisioning scenario with data flows.